Wayne Rooney ended his five-month wait for a goal as he set Manchester United on their way to a comfortable Premier League win over West Ham. 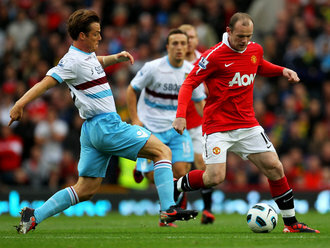 Rooney's 33rd-minute penalty after Jonathan Spector had fouled Ryan Giggs will hardly enter his personal haul of fame. But it ends the talk of his scoring drought and should go some way to easing the 24-year-old back to top form after a slow start to the season. Second-half efforts from Nani and Dimitar Berbatov, who took his tally to three in four games, sealed victory to keep United in touch with early pace-setters Chelsea. But for West Ham, the international break only provides further opportunity to worry. Without a point under Avram Grant's stewardship and unconvincing in Carling Cup triumph against lowly Oxford at Upton Park on Tuesday, the Hammers are now bottom of the table and facing a fight to preserve their top-flight status. Fabio Capello's whistle-stop tour of the north-west had taken him to Blackburn and Blackpool. It probably brought a black mood as well when he discovered Frank Lampard would miss the Euro 2012 double-header against Bulgaria and Switzerland. Whether that news is going to trigger another attempt to lure Paul Scholes out of international retirement remains to be seen. Capello is not the only one to admire the 35-year-old who, by this season's standards, had one of his quieter games, even if his passing remains sublime. Indeed, Scott Parker, a man many felt was unlucky not to get the World Cup call last summer, possibly just edged their personal midfield duel. The problem for West Ham was that Parker was one of only two Hammers to impress. It could not be lost on Capello that Robert Green was the other. The two men will forever be united in ignominy for the debacle in South Africa, triggered as it was by the keeper's howler against the United States in Rustenburg that cost England their flying start. Yet there was a reason Capello trusted Green in the first place. And his excellent save to deny Nani proved it, even if Green required the additional help of his crossbar after the United winger had latched onto Dimitar Berbatov's lay-off and let fly from 20 yards. It was the best of a number of Nani chances, one of which should have provided United with some half-time daylight. Darren Fletcher was a similar distance out when he belted a right-footed drive that was destined for the top corner before Green pushed it away. Capello could only wistfully wonder what might have been. At least he did have the certain knowledge that his top striker no longer has to worry about how long it is since he last scored. Thirteen matches for club and country had passed since Rooney put United ahead in their Champions League quarter-final against Bayern Munich at the Allianz Arena on March 30. That drought has been a popular debating point outside Old Trafford but Rooney kept any anxiety he might have been feeling well hidden as he strode up to take the penalty after Spector had been beaten by Giggs and then made a clumsy attempt to retrieve the situation. Rooney had the confidence to engage in a bit of kidology with Green before sending his international team-mate the wrong way, the celebrations somewhat subdued to say the least. Tossing away those points at Fulham will gnaw away at Ferguson for some time. Any fear of a repeat was dispelled within five minutes of the restart when Nani, one of the chief culprits on that occasion, profited from some excellent approach work from Scholes and Rooney, dumped Danny Gabbidon on his backside, then beat Green with ease. Given West Ham's almost complete inability to create anything of their own, it was effectively game over. Kieron Dyer wasted a decent chance when he fired into the side-netting but on this evidence it looks like being a bleak winter for the Londoners, especially if they fall victim to a late attempt to prise Parker away. United duly collected a third when Berbatov propelled a perfectly-executed airborne volley beyond Green after Nani had charged into the box and clipped a cross to the far post. The goal heralded a triple substitution by Ferguson, which included a debut for Chris Smalling and standing ovation for Scholes. With at least two members of his coaching team and FA technical director Sir Trevor Brooking all present, it was tempting to wonder if Capello was thinking of a kidnap attempt. Man Utd Van der Sar, O'Shea, Vidic, Jonathan Evans (Smalling 74), Evra, Nani, Scholes (Carrick 74), Fletcher, Giggs, Rooney, Berbatov (Owen 74). Subs Not Used: Kuszczak, Hernandez, Rafael Da Silva, Valencia. Goals: Rooney 33 pen, Nani 50, Berbatov 69. West Ham Green, Spector, Gabbidon, Upson, Ilunga, Faubert (Barrera 61), Noble, Parker, Boa Morte (Stanislas 90), Dyer (Piquionne 75), Cole. Subs Not Used: Stech, Kovac, McCarthy, da Costa.